Happy Mother’s Day Weekend! In addition to all the kart stuff going on, it’s Mother’s Day. 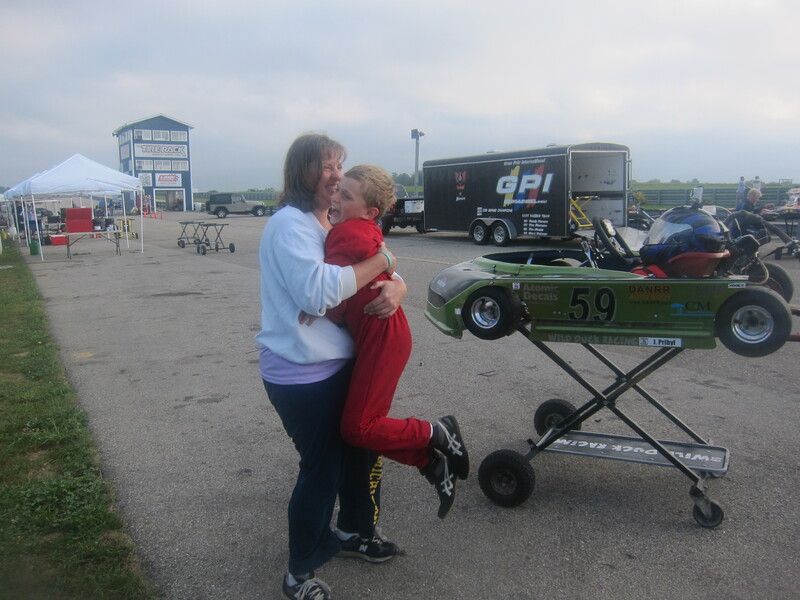 Yes, our moms let us race on Mother’s Day, and they are awesome. It’s also Jason’s birthday on Monday, so Happy Birthday too!! Wild Duck Racing returned to the track that started Jason’s road racing career, with new karts. Almost 5 years ago to the day we first visited Gateway Motorsports Park for our first ever Championship Enduro Series road race. Back then Jason was driving an LO206 powered kart in the Junior Novice class. He was not fast compared to our competition but that was not really the point. 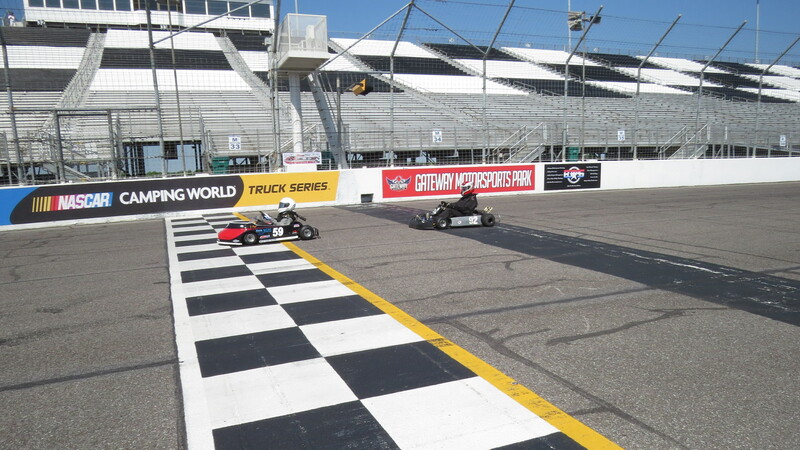 This year, we brought the sprint kart and the new road kart. Both Briggs and Stratton Animal powered and both fast. Back then he was running laps in 1:40+. This weekend he ran 1:20 in both karts. We arrived on Friday afternoon and set up our pit area in the garage. Gateway has one of my favorite garage areas because it comes with power and air. We get to use the same garages that the NASCAR Truck Series and Indy Series use a few weeks later. One of the highlights of Friday night was a impromptu interview of Jason by a karting blogger and our Amsoil supplier TJ Hollingsworth of MidLife Karting Crisis fame and owner of Winning Synthetics. I step away and let Jason do his own interviews without any coaching during it, but we do practice occasionally and he pays attention to the kart and what’s going on with it during the race day. Saturday started with practice, Jason decided to run the road kart in the break-in session to start get a feel for it, and then ran it with the first 4 cycle session. It ran ok for a few laps, until he pulled in complaining that the motor was burping in the corners. This problem would plague us all weekend and was not solved until the Sunday’s race. The sprint kart was amazing, it was fast and just needed some slight gear changes to optimize. It was fast enough that he practiced with the 2 cycle group and had no troubles with with traffic. Once practice was over things really fell apart. I found that the sprint frame had broken on the right side and needed to be welded. In the meantime Jason took the road kart to the 4 cycle central pit for some investigation. While there, he was grabbing tools and tearing down the motor so Regan could take a look and hopefully find the issue. This was a real first. Jason put forth a great effort working on that kart trying to get it back into racing shape, unfortunately everything checked out and we need to keep looking for the problem. While putting the newly-welded sprint kart back together, I found that one of the rear seat struts was also cracked and needed to be replaced. With only 15 minutes before the race start. I was really thrashing on the kart to get it fixed. Tools and parts were flying in our pits along with some strong language. With just a few minutes to go, I managed to get the kart to the grid and just in time for the start, only because the start was delayed by some other issue. Race 1 and 7 in the sprint kart went very well with Jason setting his record lap times and putting on a great show with the Animal 360 karts. The road kart was not as successful. He got to start the race and pulled in after the first lap with burping issues. Back to work for the rest of the evening. Saturday’s race 1 in the sprint kart was great again. It was really dialed in and he was doing great things, working on passing and timing, and working on the draft. He is kart is as fast as the slow pack of 360s. If he continues to get the draft in the straights he should be able to really fly. We finally find the problem with the road kart: the engine was so thirsty for methanol, the fuel system was vacuum locking. However, since we did not get much practice in we did not get much tuning and it was handling poorly. During the race the rear tires broke free while exiting the corner into the big oval and it backed into a tire barrier pretty hard. Jason was checked out and was OK but his racing day was over early. The kart sustained a bit of damage. Between this and some other issues we are are forced to skip the Michigan International Speedway race since there is just too much do to get ready. Once again thanks to Regan at 4 Cycle Central and Marty Murray for helping keep the karts on the track, and to Kat Murray and Judy and Mark Nielsen for help after the race, yummy dinner and excellent company on Friday night. Thanks to our Moms, and Grandmothers for their support and for getting us this far.